I may have mentioned it before, but Swamp Thing is the character that brought me into regularly reading superhero comics, and the DC Universe in specific. I’d been reading comics already, primarily in my father’s collected editions that were becoming more prevalent in the 1980s, but it wasn’t until an issue of Saga of the Swamp Thing that I became interested in reading regularly. And that led me to read a story in Gotham City, which led me to reading Batman, then Justice League, and so on. So when I see that he’s part of this “Milk Wars” un-event…I get a little protective. 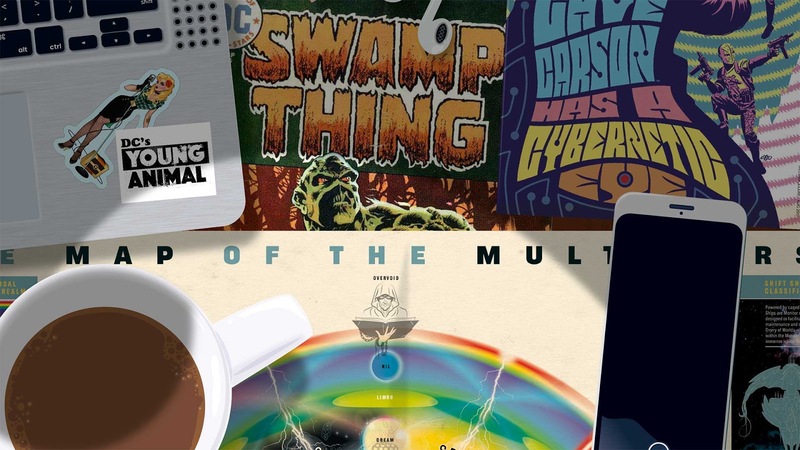 Find out if I’m the smothering type in my review of Swamp Thing/Cave Carson Has a Cybernetic Eye Special #1, right here! So we all know what Retconn’s milk does now: makes otherwise extraordinary lives into ordinary, mid-20th Century pastiches, perfect for mass marketing. IN the cases of Cave Carson, his daughter Chloe, and Wild Dog, their world has been transformed into a corporate cubicle farm, where Chloe is Cave’s sweater vest-wearing colleague and Jack is part of the security detail. Thing is, the milk isn’t settling so well in Cave’s stomach, and when he vomits all over the floor, we find out why: Swamp Thing was in there! Or rather, Swamp Thing goes there once Cave stuffs a bunch of vegetables down his gullet. It’s a Swamp Thing thing, you wouldn’t understand. After he makes Chloe and Jack puke up their milk, snapping them back to the actual order of things, Swamp Thing explains that he’d made special arrangements with Cave to while they investigated Retconn headquarters, a building Swampy has brought with him, in miniature. Cave sent his cybernetic eye into hiding, and Swamp Thing leaped into his stomach before they took their waking milk nap, and so here we are. Now reunited with his eyeball, Cave delves into Retconn’s computer systems to learn that they’ve been selling humanity’s hopes and dreams since at least the time of Christ, and this reality-altering milk is helping them make it all palatable for everyone. Except the lactose intolerant, I suppose…no, actually they have Milk Plus for that. Just then, Wild Dog reappears, again an agent of Retconn, with two gross bug sidekicks in tow. While they scuffle and Cave sprays bug spray on ‘em, Swamp Thing knocks off Jack’s mask, which cuts Retconn’s spell and brings him back to the fold. They head on off to the Human Resources department, where hundreds and hundreds of humans are actually kept in drawers, their minds being mined by Retconn for, uh, delicious memories and thoughts, I suppose. 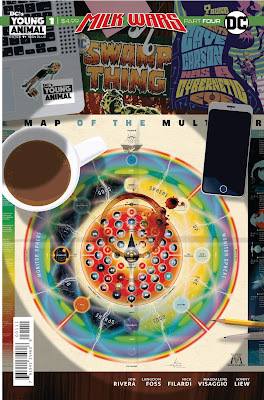 When the denizens of Retconn start banging on the door, Cave records a quick message to his robot eyeball—the very same one we’ve seen in other issues during this event—and tells Swamp Thing to grab Chloe, Jack and the eye and spread the word like Paul Revere. 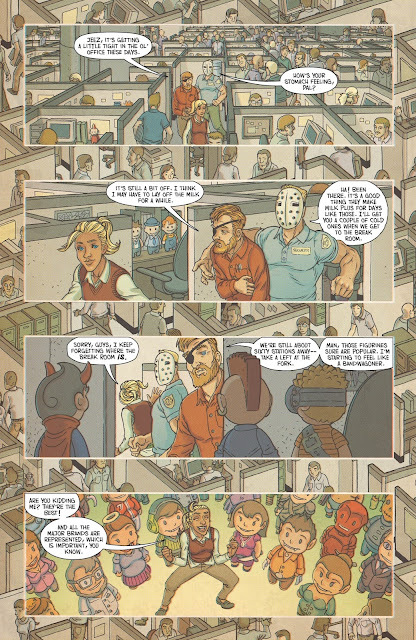 Cave stays to hold off the horde, which winds up being his effective surrender to a bunch of misshapen ghouls and mutants, who probably have a lot of questions to ask him. 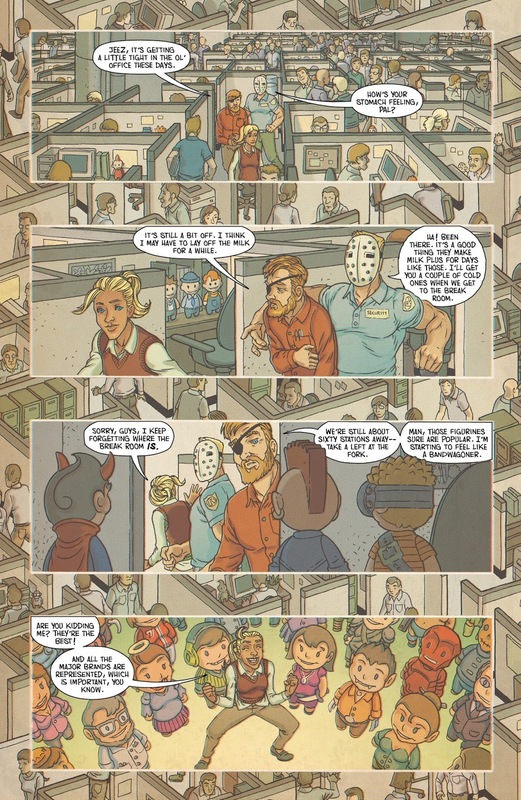 So this is a fairly straightforward narrative, considering the weirdness of the story, but I can’t get over the feeling that it’s a Doom Patrol tale, featuring Cave Carson and Swamp Thing in this particular instance. Chloe and Wild Dog, in particular, don’t read the same way as I remember in the initial series. 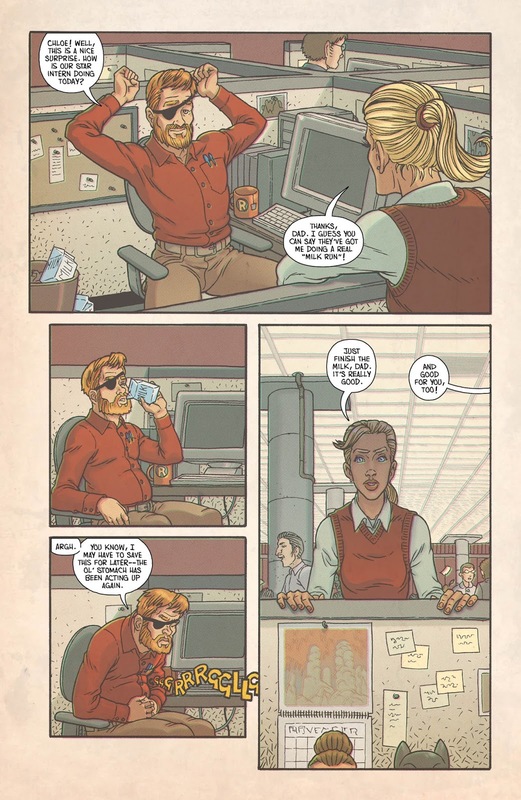 The artwork is good, but I think it was the wrong fit here—considering the unique style Oeming lent to Cave Carson Has a Cybernetic Eye, and the numerous artists that have lent their detail-heavy styles to Swamp Thing, this art struck me as a little too playful and tone-deaf to depict the things happening in-panel. 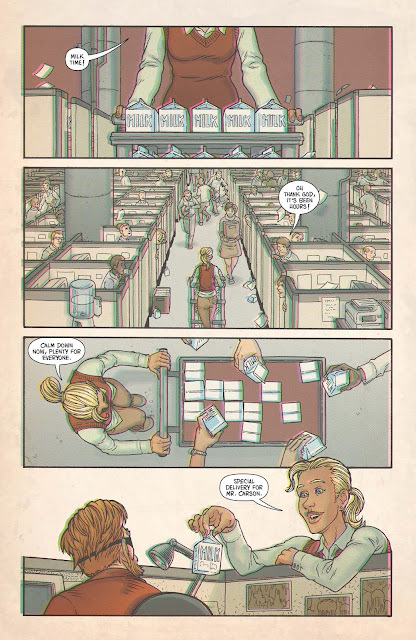 This art might have worked better on the Shade the Changing Girl/Wonder Woman Special #1 that came out last week. 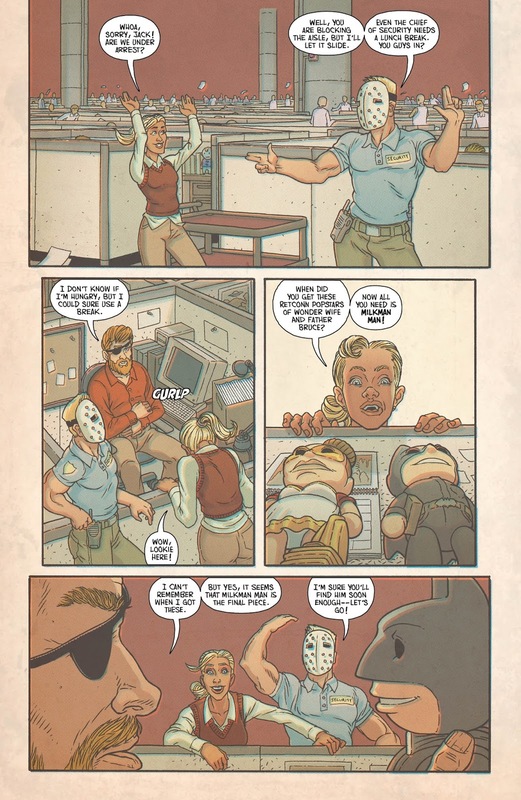 All considered this singular issue isn’t horrible, but as another wedge in this Doom Patrol pie that goes way too far to be cute, it’s a disappointment. Our journey through the milk-infused realities of Retconn continue, and it's starting to smell a little sour. The artwork, while adept, doesn't marry to the story's tone, and the narrative is littered with padding. Still, it can be understood from start to finish, which puts this issue in rare company for "Milk Wars." I tapped out after the godawful WW/Changing Girl Milks Wars issue. And the cover on this is one of the ugliest I have ever seen put to a page. I simply could not buy it. Nice to hear it is easier to understand that the abortion of the previous Milk War issues. that is one of the worst covers ever!! !